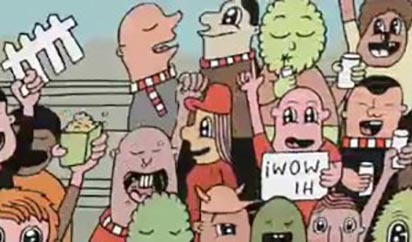 Mastercard PayPass facilities are being promoted in a couple of television commercials featuring animation by Australian cartoonist Jeremyville. In “Interception”, while the action’s happening on the field, one poor guy’s digging into his pockets for cash to buy his hot dog. In “The Priceless Hit” the guy’s digging into his pockets for cash to buy his peanuts. MasterCard PayPass was developed at McCann Erickson New York by executive creative director Joyce King-Thomas, creative directors Robert Frost and Michele Raso, art director Richard Kluver, copywriter Jonathan Granof, agency producer Anna Beth Weber. Animation was provided by Jeremyville (Jeremy Andrew) via Mokem with producer Megan Mair.